These new business machines are powerful, light and reliable, sporting Haswell processors and being certified with MIL-STD-810G. After launching quite a few new consumer laptops, HP is paying attention to its business customers and releases the high-end EliteBook 800 Series laptops and ultrabooks. This family consists of three models, namely the 12.5-inch 820, the 14-inch 840, and the 15.6-inch 840. According to HP, all these new portables were conceived "for mobility, durability and security, while pleasing the eye with a radically thinner profile wrapped in a performance-inspired design." The HP EliteBook 820 is the junior of the family and has a thickness of just 0.83 inches, a weight of less than 3 pounds and sports a 12.5-inch display. Compared to the similar models of the previous generation, it is 35 percent thinner and 18 percent lighter. The EliteBook 820 is powered by a Haswell processor (i3, i5 and i7 options are available), 4 GB or 8 GB of memory, as well as a SSD or HDD of your choice. The base model is priced at $859. Next, the HP EliteBook 840 weighs 3.48 pounds in the standard version but the optional touchscreen pushes its weight up to 3.92 pounds. It is less than 0.9 inches thick and it can be powered by Haswell processors up to i5 with Intel HD 4400 graphics and 8 GB of memory. The optional battery can increase its autonomy to no less than 33 hours and this laptop can be purchased with a SSD or HDD of your choice while its base price is $799. 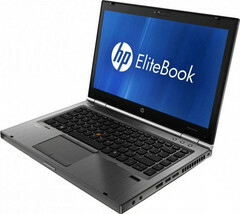 Last member of the HP EliteBook 800 Series is the HP EliteBook 850. Its top configuration sports 16 GB of memory, a Core i7 processor with Intel HD 4400 or AMD Radeon HD 8750M graphics and its minimum weight is 4.15 pounds. This model's price starts at $939. All the HP EliteBook 800 laptops mentioned above meet MIL-STD 810G testing for toughness and reliability, sporting a magnesium unibody chassis reinforced with aluminum accents. They are available in the United States already and can be configured and purchased via www.HP.com. For more details, please check the press release below. PALO ALTO, Calif., Oct. 1, 2013 - HP today unveiled a portfolio of elegantly styled business notebooks that redefine mainstream mobile computing, including secure, reliable Ultrabooks designed to fit the needs of any business user or IT budget. Businesses are in the midst of a workplace transformation as employee demand for stylish mobile devices competes with IT decision makers' need to keep company technology secure and manageable. With this in mind, HP designed its new EliteBook and ProBook series notebook PCs for mobility, durability and security, while pleasing the eye with a radically thinner profile wrapped in a performance-inspired design. - The HP EliteBook 800 series is up to 40 percent thinner and 28 percent lighter than previous generations, while delivering critical enterprise features, allowing businesses to provide the Ultrabook experience to everyone in the office. They're designed for frequent travelers with an option for up to 33 hours of battery life and MIL-STD 810G certification for business-rugged reliability. - Available on HP EliteBooks, HP Sure Start is exclusive to HP BIOSphere and was developed in collaboration with HP Labs, the company's central research arm, to automatically restore compromised systems so end users can maintain productivity reducing downtime. - The HP ProBook 600 series is tough yet stylish, delivering a broad selection of business technologies and legacy features, including brilliant high-definition (HD) displays and a range of connectivity options. - Designed to fit the needs and budgets of smaller businesses, the new HP ProBook 400 series notebooks are durable, stylish and fast, featuring the speed of the latest 4th generation Intel® CoreTM i3/i5/i7 processors. - The HP Security Smart Jacket for HP ElitePad provides mobile authentication, ensuring secure login to corporate networks for mobile professionals. "IT decision makers today are faced with history's most diverse and technically savvy workforce, and their demands for devices that reflect personal style and productivity preferences present a unique business challenge," said Enrique Lores, senior vice president and general manager, Commercial PCs, HP. "HP is leading the transformation of the workplace with innovative and mobile business PCs designed for style, but built for security and reliability." The HP EliteBook 800 series notebooks are engineered with the security and management features required by enterprise IT, but are customizable to fit the needs of businesses of all sizes. The new series offers Ultrabook qualification for select notebooks, and features a thinner and lighter profile ideal for travelers, and a sophisticated design in a rich graphite black with meteorite gray accents inspired by high- performance automobiles. HP EliteBook 800 series notebooks meet MIL-STD 810G testing for impressive toughness and reliability, with a magnesium unibody chassis further reinforced with aluminum accents and featuring an optional back-lit keyboard to maintain productivity in low-light settings. A durable drop-jaw hinge Ethernet port ensures reliable connectivity without the need for a dongle or other adapter, while HP Trust Circles ensures that only assigned contacts can access critical files. - The HP EliteBook 820 G1 is up to 35 percent thinner and 18 percent lighter than previous generations, featuring a 12-inch diagonal display and a weighing less than 3 lbs for business travelers who need a light, full-featured device. - The HP EliteBook 840 G1 is Ultrabook qualified and offers a 14-inch diagonal display with an optional touch display optimized for the Windows 8 experience, plus an amazing battery life of up to 33 hours with the optional secondary Slice Battery. - The HP EliteBook 850 G1 features a large 15.6-inch diagonal display for easy viewing and offers an optional Ultrabook qualification. It is powered by the latest generation Intel architecture and protected by the full HP Client Security portfolio. Designed in collaboration with HP Labs, HP Sure Start is the latest breakthrough innovation in HP business platform protection and an exclusive self-healing BIOS solution. Available on the new HP EliteBook 800 series, this unique hardware-based solution detects and remedies malware and security attacks to the BIOS. HP Sure Start Crisis Recovery Mode immediately and automatically detects the effects of an attack or corruption and replaces the corrupted BIOS Boot Block with a clean copy from the secure memory-all within about 30 seconds. This technology allows businesses to eliminate employee downtime due to a nonoperational unit caused by BIOS attacks, and helps save IT time by avoiding help desk calls or service ticket requests. Plus, its hardware-based approach means it is effective against new sources of attacks, even those not yet identified. The HP ProBook 600 series PCs are highly configurable HP business notebooks packed with the latest technologies, allowing IT administrators to tailor them to the specific needs of their end users, and only purchase the functionality they need. Optional 4G LTE WWAN helps keep business connected, while the optional long-life battery keeps businesses productive with business-day battery life. With USB 3.0 and DisplayPort 1.2 paired with new HD+ and full HD display options and top-mounted speakers, employees can enjoy an outstanding user experience whether connecting with colleagues across the conference room or around the world. - The HP ProBook 640 G1 notebook has a 14-inch diagonal display and is powered by the latest Intel fourth-generation Core i7, i5 or i3 dual-core standard voltage processors for high performance. - The HP ProBook 650 G1 notebook operates with crystal clear DTS Sound+ and boasts a 15.6-inch diagonal HD display. - The HP ProBook 645 G1 notebook runs on the latest AMD 35W quad-core or dual- core APUs. With a 14-inch diagonal display and multiple docking options,(9) the HP ProBook 645 G1 is built to perform. - The HP ProBook 655 G1 notebook is 19 percent thinner than the previous generation and delivers great visual performance with full-HD options for the 15.6-inch diagonal display and AMD Radeon HD 8000G Series graphics. The HP ProBook 400 series now includes three notebooks-the HP Probook 440 G1, the HP ProBook 450 G1 and the HP ProBook 470 G1-with the speed of the latest 4th generation Intel Core i3/i5/i7 processors to help business users work faster. The HP ProBook 450 G1 also features an optional touch interface on a premium shatter-, reflection-, smudge- and scratch-resistant screen, enabling greater productivity by providing another way to interact with apps and data. The HP ProBook 400 series is designed to look good on the go with an attractive meteorite gray chassis with soft touch finish and an all-metal keyboard deck. The HP ProBook 400 series adds substance to its style with a new hybrid hard drive option that offers the responsiveness of an SSD with the capacity of a traditional hard drive, along with optional 4G LTE, HSPA+ WWAN, Skype and rich DTS Sound+. The new HP Security Jacket adds critical functionality to the HP ElitePad, the No. 1 Windows commercial tablet on the market. It allows device and network access only to those with approved access through single- or multi-factor user authentication via a thin and light jacket design. Ideal for government, healthcare and security-sensitive corporate environments, the TAA-compliant Security Smart Jacket includes a Smart Card Reader that allows FIPS 140-2 encryption solutions and offers an optional fingerprint reader, both of which meet FIPS 201 requirements. Additionally, the HP Security Jacket offers USB 3.0 and HDMI ports for convenient connectivity. Paired with HP's included Device Access Manager software with Just In Time authentication, the jacket's USB port can be easily secured for limited, authorized use of removable storage devices during a brief allotted time after authentication. The HP Security Jacket is compatible with the HP ElitePad dock for easy desktop productivity with dual display support. - The HP EliteBook 800 series is now available in the United States, with pricing starting at $799. - The HP ProBook 640, HP ProBook 645 and HP ProBook 650 are expected to be available in the United States by Nov. 18, while the HP ProBook 655 is expected to be available in the United States by Nov. 25. Pricing for the HP ProBook 600 series starts at under $699. - The HP ProBook 400 series is now available in the United States, with pricing starting at $499. - The HP Security Jacket for the HP ElitePad is available now, starting at $249 with integrated smart card reader and $439 with the addition of the optional fingerprint reader.